Fresh and eager from the success which she scored in her small parts at the Winasset summer theater, Carol Page comes down to Broadway determined to find a part. She is ready to take anything, even the lowliest walk-on, for her dander is up: her father has taunted her with the remark that she will "go bust in two months." She has saved nearly $400 from her summer salary and she means to stretch this until a producer has given her the nod. With her friend Julia, who is looking for a part in comedy, Carol finds a room in a theatrical boardinghouse. She also finds Herbert, a pet skunk, and his vaudeville trainer on the floor above. But week in, week out, she encounters nothing but discouragement in the casting offices. "Sorry, but you are not the type - perhaps we can let you know later." Those turn-downs drive her frantic. When her money has dwindled to the point of desperation, Carol is lucky to find herself a job as an usher in the balcony. Then she picks up a little work on a radio program, she gets a walk-on part in a play which soon flops, and at long last she comes to her real trial on Broadway. 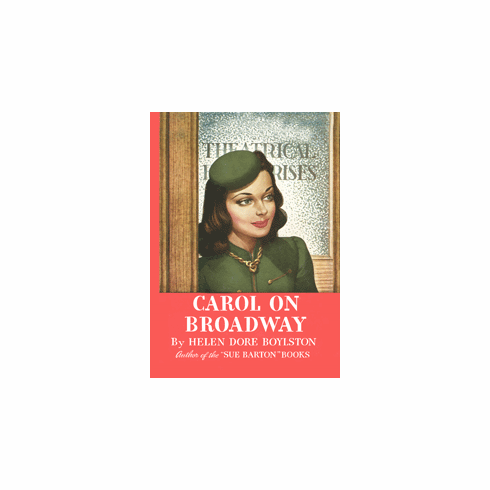 The story of Carol's and Julia's adventures on Broadway and the story of what the theater grudgingly gives to them has the true ring, the warmth and the color, which the reader expects of a Helen Dore Boylston story. This book is perfect for every girl who ever dreamed of "going on the stage."